This shamrock polymer clay barrette will look great in your hair, or your child's hair, for St. Patrick's Day. It is very easy to make. 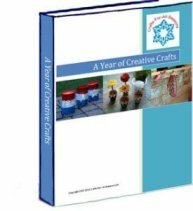 You do not have to be very experienced with polymer clay to make this craft. If you have never worked with polymer clay before, be sure to check out my polymer clay article before starting (a new window will open). This will give you extra tips for working with this wonderful stuff! This craft is very similar to the pipecleaner barrette craft, the only difference is all the parts are made of clay. 1. 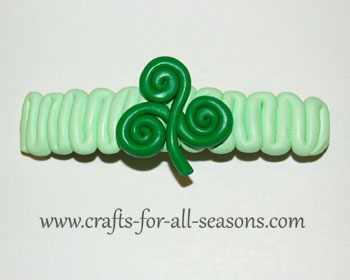 Begin the shamrock polymer clay barrette by making a very long, thin rope out of green polymer clay. Choose the shade of green you want to be the background. In this example, I used light green to be the base color for the clip. 2. Begin at the end of the clip and place the end of the clay rope against it, vertically, and press in slightly to attach. Begin to wind the clay rope up and down the clip, moving left to right across the clip (or right to left if that is easier for you). See the photo below. 3. Now that the base of the clip is done, it is time to make the shamrock. Begin by making a long thin rope again of green polymer clay, this time with the other shade of green. Then, cut this long rope into thirds, so you have three pieces relatively the same size. 4. Make a spiral out of each rope, going clockwise. On one of the ropes, leave a tail hanging. These are going to be three leaves of the shamrock. Next, assemble the three together to make the shamrock. Use the photos below to help you. 5. Carefully place this clay spiral shamrock on the clip. It can be placed in the middle or off to the side. 6. Bake the clay according the package directions, usually 265 degrees F for 20-30 minutes. You can bake the clip on a piece of white cardstock on top of a cookie sheet to protect the pan. 7. Let the polymer clay shamrock barrette cool completely, then coat with polymer clay glace or a acrylic sealing spray to protect (optional).